OFJCC member Rose Hagan shares her journey to better health with Specialized Trainer Joe Kelso. When I started working out with Joe Kelso, I was at least 20 pounds overweight and had plantar fasciitis and a bad knee. I couldn’t run for three minutes on the treadmill and had a hard time putting my bag in the overhead bin when traveling. My goal was to be healthier, but my expectations were low given the injuries. Joe saw the potential in me, worked around my injuries, and pushed me to gradually increase both my strength and my cardio conditioning. Now I’m approaching 50 and in better shape than I was in my 30s! I ran a 5K (my first in 30 years) and then a 10K, have dropped two sizes, and am healthier and have more energy than I’ve had in years. I have also cleaned up my eating (I gave up carbs), so my blood sugar levels and energy are more steady throughout the day. Joe continues to encourage me to reach new fitness goals and makes sure I’m balancing strength and flexibility to minimize the risk of injury. Thanks, Joe! Rose Hagan is an artist who works in fused glass, painting, and digital art. She teaches fused glass at her studio in Sunnyvale. Her glass art is exhibited at Gallery House in Palo Alto and her paintings, digital art, and glass are exhibited at Serendipity Gallery in St. Louis, MO. 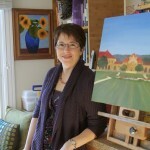 You can see her work online at www.rosamoderna.com (glass) and www.rosehagan.com (painting and digital art). Way to go Rose!!! Such an inspiration!